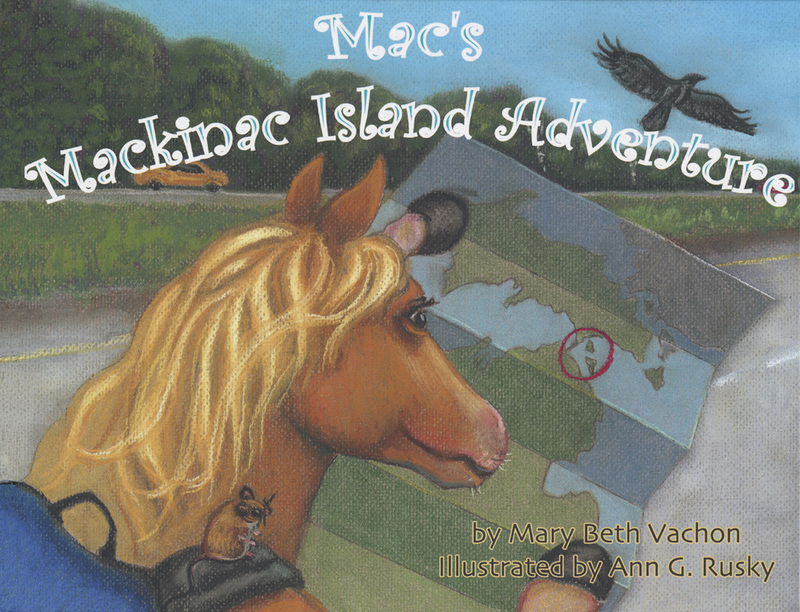 The story is about Mac, a spirited little Palomino, who never gives up on his dream of going on vacation to Mackinac Island and having an exciting adventure. 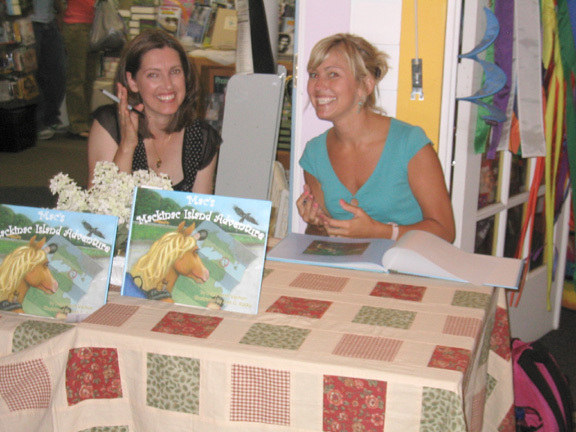 Me (left) and Marybeth Vachon at our first book signing, on Mackinac Island. Meeting Smooch who would become my model for Mac. 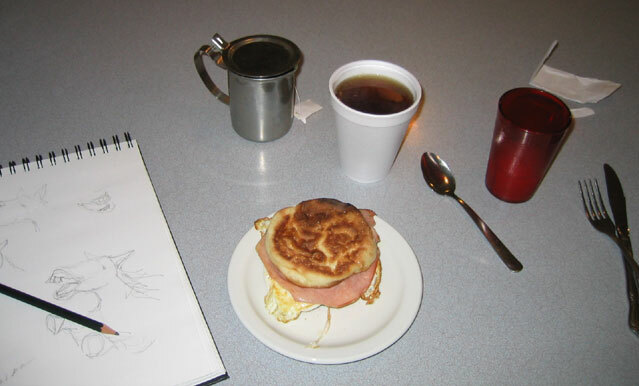 The morning I got up early, explored the island, met Smooch, then did sketching over breakfast. My son, his hat, and his backpack are what I incorporated into the illustrations as examples of what Mac would do. I used all the things he enjoys as a reference for Mac's Adventure. I was pleased with the opportunity to collaborate with Mary Beth (Sack) Vachon on her charming story. 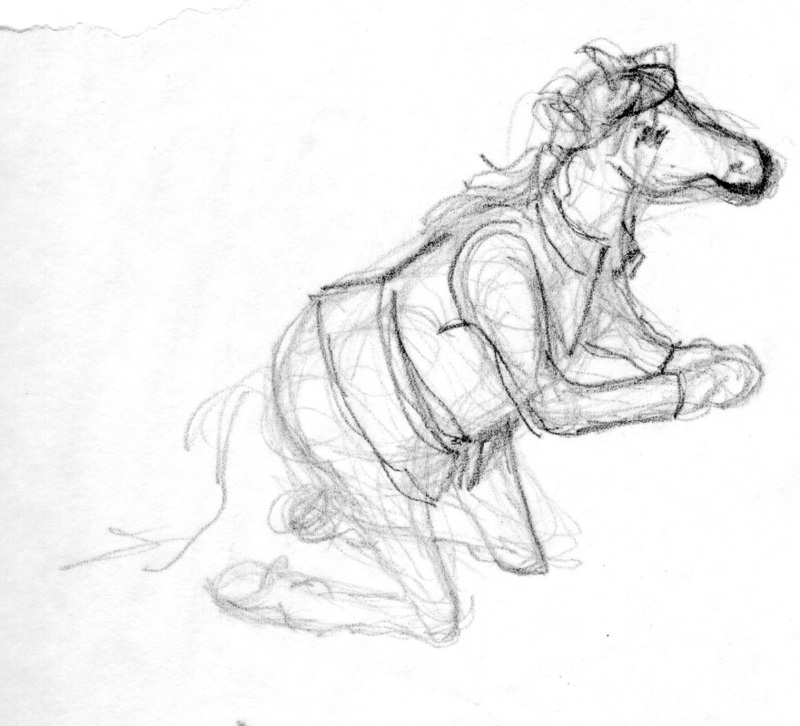 She brought ‘the little horse’ to life with his determination and playfulness. When many authors and illustrators don’t get to collaborate, and most don’t even meet, it was fortunate for us to be able to create this project together. 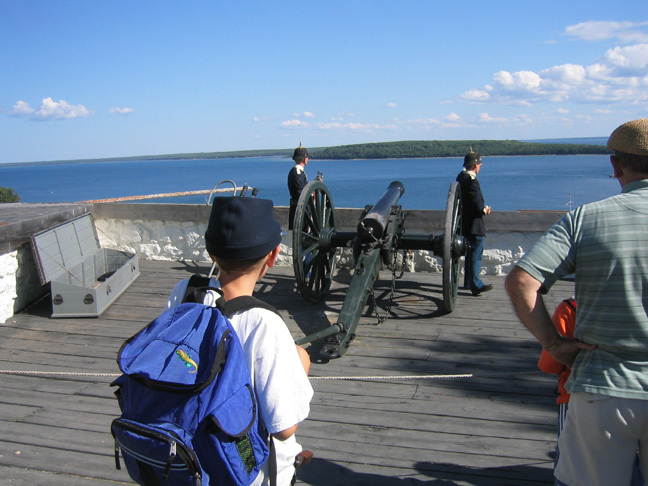 Creating Mac’s Mackinac Island Adventure was a great thrill for us. It certainly was a labor of love. It was nine months to the day, from the weekend we went up to the Island to explore the idea, to the day we held the book in our hands. For me, it was great fun creating the visual image of Mac. 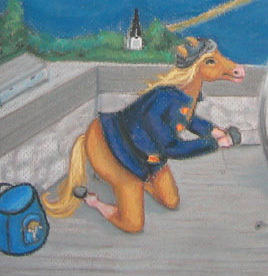 Since the horse I used as inspiration looked similar to the working horses on the island, I wanted Mac to be easily distinguishable from the rest. I borrowed on Mary Beth’s sparkling brown eyes, effervescent smile, and blonde hair to give Mac his palomino image. Many thanks to Susan Bays of Arbutus Press, Traverse City, Michigan, for her spark of an idea, and support to make this book a reality. I am eternally grateful for her belief in the project and the chance to allow us to tell the story as it moved us. The Beginning. 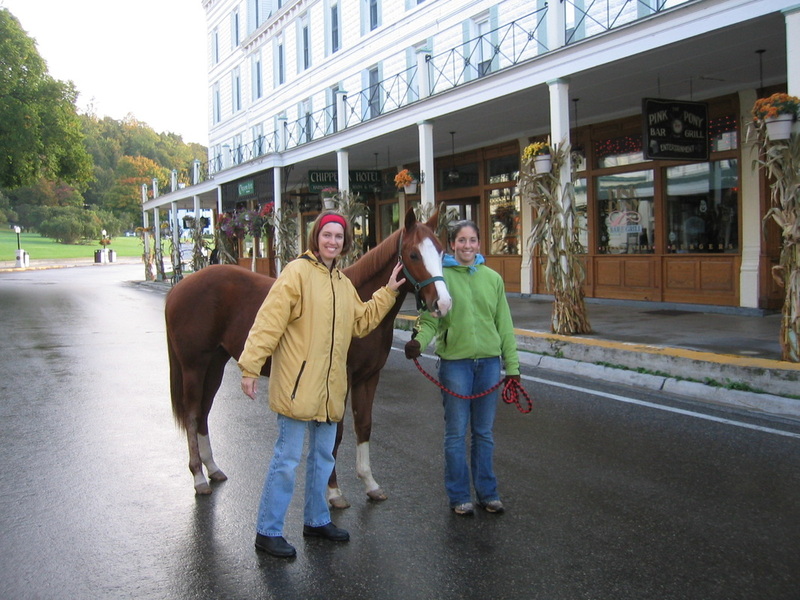 On a chilly, gray, weekend in October 2004, Mary Beth, her sister-in-law Lisa, and I visited Mackinac Island together, as a reference trip, and saw the adventure through Mac’s eyes. We bundled up, toured the island on foot and carriage, and let our imaginations out to play. With uninterrupted time to explore, we created the storyline, drew up rough thumbnails, and even found a time to browse the shops, eat fudge, and brainstorm over some delicious meals. Together the complete storyline, with thumbnails fell into place and changed very little in the end. I took hundreds of pictures as reference which helped me remember details, when I was sitting at my drawing table months later. After our weekend adventure, we each went home and worked on our part of the story. MB had the story completed by Christmas, then it was up to me to bring the sketches from our imagination to paper by March. My Approach. I approached the illustrations for the book was with the island in mind. I needed Mac to be whimsical enough to do the silly things he does, but I needed the landscape to be recognizable so I had to keep the drawings somewhat realistic. I chose the format to be horizontal so that when the book was opened the landscape would stretch widely to show its glory. 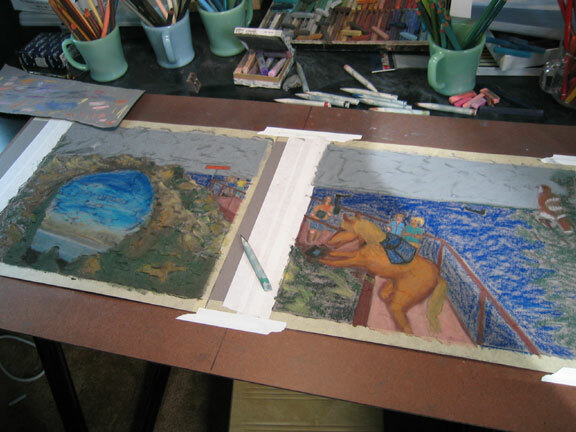 I chose chalk pastel because I like working with that media, and revealed the painterly side of the Mackinac palette. I was also working through the winter months and didn’t want to be breathing in solvents, if I used oils. Using pastel, I tried to use ambiguous patches of color that allowed the eye to ‘read’ the shapes as something identifiable; like a smudge of gray that the eye thinks is the Grand Hotel or a dash of red, that reads as a lighthouse. Mostly, I wanted the drawings to playfully tell a story while still conveying the beauty of pastel on paper. 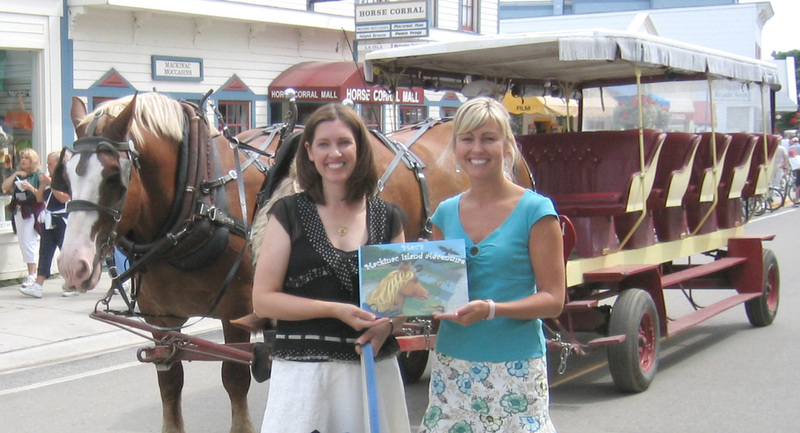 Mac’s Mackinac Island Adventure was the first picture book for us both. We enjoyed the process and fell in love with Mac while creating him. We can hardly wait for Mac to take another adventure. 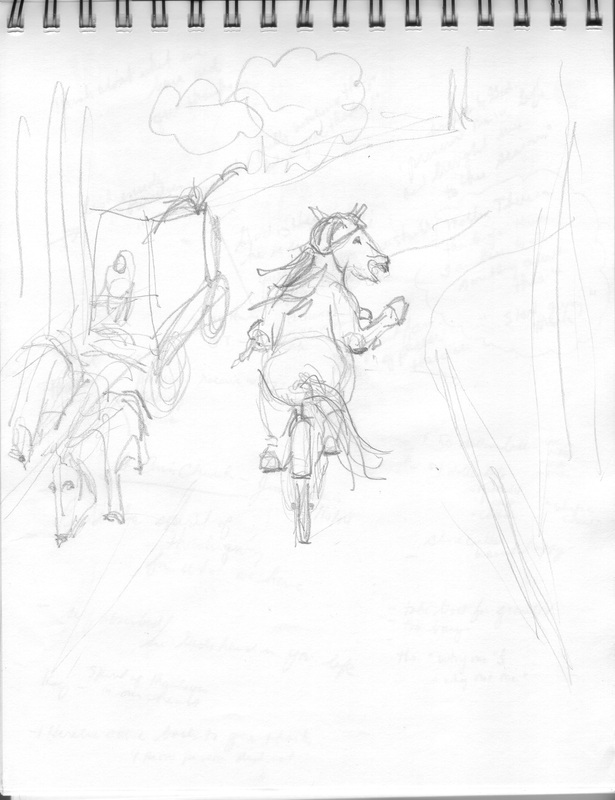 This is a page from my sketchbook trying to figure out how Mac would ride a bike. This is a drawing before I transfer it to charcoal paper and do the chalk pastel layers. 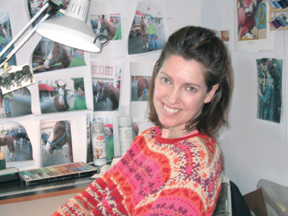 My son took this photo of me when I was working at my drawing table. I was still in my jammies, quietly working in the early morning. Notice all the photos I have of Smooch for reference. At my drawing table working on the images side by side. 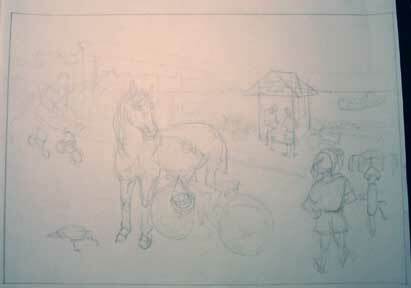 First, I lightly sketched in pencil, then ground in the color. I would use Spray Mount between layers of color. The exciting day I received the finished hardcover book and we read it together for the first time.